I never made tofu scramble before, but wanted breakfast food other than oatmeal. I didn’t have firm tofu, I just used the silken one in the shelf stable package, and it fell apart but that was ok! I added button mushrooms and a whole onion, otherwise followed the recipe. My family and I loved it, thank you! Delish! I added 1/4 tsp paprika, 1/4 tsp cayenne pepper and 1/4 tap basil and used 365 veggie broth. Also added roasted red pepper. Yum! Leftovers? Isn’t that serving for 2? 🙂 Funny you mentioned the refried beans. When I went into the cabinet to grab the black beans I saw a can of black fat free refried beans I had, and wondered how it would be with that. Definitely trying that next. More than enjoyed this dish. Can’t wait to have it again. Highly recommended. 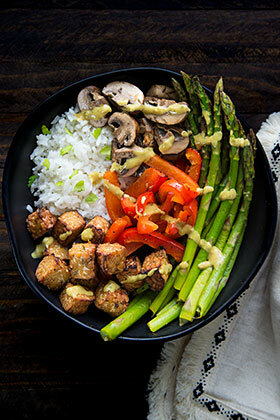 Hi Mary- I posted detailed nutritional info at http://hathayoga.com/vegan-tofu-scramble/ (at the bottom of the post). If you have any questions just let me know! 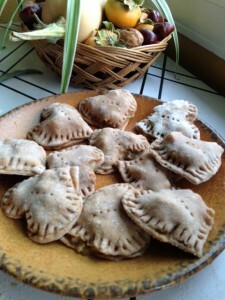 Hi Clea- So fun you made the recipe! I bet it was good with baby kale. I also often use the leftovers in wraps with greens, must run in the family! :) I add Trader Joe’s Fat Free Refried Beans (which I love!). OMG….delicious. Is there a way to post a pic of it here? Well, I made it yesterday for brunch and it turned out great! The bouillon cubes I had were Rapunzel. Also, I only had baby kale, but other than that, followed it exactly. I used my tofu press, which I love. Next time I will add red bell peppers. I will use the leftovers for wraps with greens. Hi Shellie- Can’t wait to hear how your version comes out! I should mention that I drain the tofu, but I do not dry or press it. In previous versions I used to press the tofu, but it came out a little too dry for me. BTW, Nasoya makes a cubed tofu which is a pleasure to work with. They’re a small cube, which are easy to dry (can’t use it in my tofu press), but I will use it with this recipe. This is dinner tonight. I know it’s going to be good. Love everything in the recipe. I did whip up that bouillon the other day, so we’ll see how that works. Thanks for posting..
Nutritional stats/ info pls? looks great! I am going to try Rapunzel’s vegan vegetable bouillon no salt added for this recipe. I’m cooking my first batch of dry black beans in my new pressure cooker today. I can’t wait to try this recipe. Sounds great, Ayal! Will try this and will keep you posted. Love, your cousin, Clea. Hi Shellie- Thanks so much for the broth recipe, it sounds great! This is from ‘Happy Herbivore’, and can be used in place of the bouillon. No added salt. Then mix 1 Tbsp of the mixture with 1 cup warm water to yield 1 cup of no chicken broth. It tastes great and made with pantry staples! Hi Winona- You’re correct this is not a sodium free recipe (just low fat vegan). My jar of bouillon says 650mg of sodium per tsp, so 1 1/2 tsp means 975mg total for the recipe. Since the recipe serves roughly four, that’s approximately 250mg per serving. Yikes, I went on line to find out about ‘better than boullion’ boullion, and for one teaspoon there is “700mg” of sodium!!!!!!!!!!! not good!!! 1/2 cup liquid….perfect. I can always wake it up, but I’d rather not use some of the ingredients in the bouillon. I’m definitely going to give this a try, and will let you know. Thanks. Hi Shellie- You could substitute 1/2 cup of liquid veggie broth for the bouillon and water (so the total amount of liquid remains the same). Fyi this might affect the flavor a bit since the bouillon is pretty concentrated. If you give it a try I’d love to hear how it comes out! This sounds great. I do have ‘Vegan Cooking for Carnivores’, but he uses things I stay away from….one being the bouillon. Any idea how much liquid veggie broth I might substitute for the 1 1/2 tspns? Thanks. I eat tofu scramble all the time! 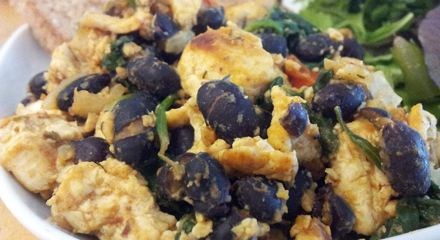 I make Happy Herbivore’s basic scramble recipe with spinach, olives, and salsa. Maybe one day I’ll branch out and make this recipe. It seems a bit more involved, but if you like it then it’s worth a try!